Pharrell Williams is co-producing Blink-182's new album. The pop punk group recently revealed that their follow-up to 2016's 'California' will "go off in completely weird directions", and that appears to be thanks to the involvement of the 'Happy' hitmaker and pop production duo The Futuristics. The trio – completed by Mark Hoppus and Matt Skiba – are also still working with their longtime producer John Feldmann. 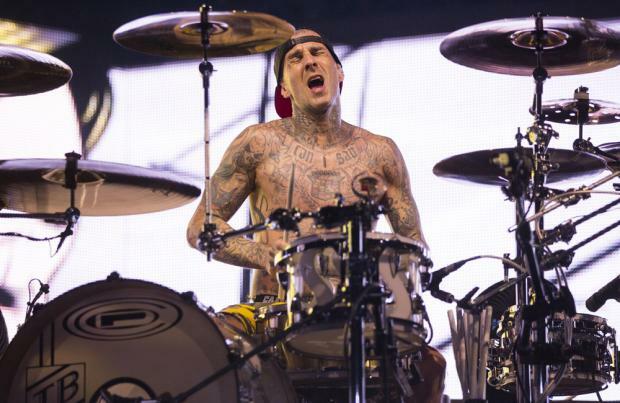 Speaking to Front Row Live at his MUSINK Music Festival, Tattoo Convention & Car Show, the band's drummer Travis Barker spilled: "Feldmann's working on the record. "But we've also – I've been doing a bunch of writing just at my studio and bringing it to Feldmann's -- we also just worked with Pharrell on the album." The 43-year-old stickman says that their new record will have the same "vibe" as their 2003 self-titled debut, in that "anything goes". He said: "It's kind of anything goes. "It's the same vibe that was going on when we did [2003 eponymous album] self-titled. "I think we're creating one of the most important Blink albums. I'm really proud of it." The 'All The Small Things' hitmaker also claimed that the record will "definitely" drop before the band play Warped Tour this June. Bassist-and-vocalist Mark recently promised the album will still have elements of their "foundations" but will also have new exciting elements too. He said: "After playing in this band for 27 years, I want to push it and do different things and take blink to places where we haven't been before. We're really trying to do that on the new record. We want to do with our band what we did in 2003 with 'Blink-182', where we take our foundations and go off in completely weird directions." And the 46-year-old musician says the band is "everybody's priority" despite them having their own "outside interests". Mark – who recently launched his own band Simple Creatures with All Time Low's Alex Gaskarth – said: "That's the thing, our main bands are our main focus and will always be. We all have our outside interests and our outside things, but we're pretty straightforward with one another; blink really is everybody's priority and that's understood among all of us."